Ever Creep out an MLB Player? Me either. | Jamie-Leigh T.O. Ever Creep out an MLB Player? Me either. Since a ton of people find this blog everyday by looking for “Travis Snider’s girlfriend” or “does Travis Snider have a girlfriend” (which I assume could only be fueled by this post), I figured I might as well fuel the fire. I have always been a fan of baseball. I played when I was younger and my dad was the coach. To anyone who thinks that would mean I’d get special treatment – let me tell you how my dad said I was too much of a space cadet to pitch and I would get hit in the face by the ball when I’m not paying attention. He could have gotten that idea from the fact that I spent most of my time in the outfield picking dandelions and running from bees, or he could have just made it up. I’ll let you decide. I’ve been watching Travis Snider for about 2 seasons now, and although I don’t really understand baseball stats, I knew he was doing well for his first couple years in the major league. I also like that he played for the Lansing Lugnuts because heterosexual-life-partner Elissagrew up in East Lansing. I also really like Snider for his looks. It’s pretty unusual for me to fan-girl out over guys. After my childhood obsession with Devon Sawa and then pre-teen obsession with Leonardo DiCaprio, I never really got back into decorating my whole room with pictures of guys I liked. I should also be clear that the famous guys I find attractive have absolutely NO bearing on the guys I find attractive IRL. I’m not sure why, that’s just how it goes. I’m also not that in to muscles, but part of the reason why I like Snider is because he’s a real beefcake of a man, and not in that disgusting Jersey Shore way. 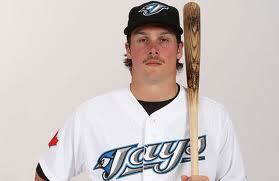 Not a big fan of mustaches (other than for comedic value), but Snider has one and I love it on him. Remember his mullet too? Also not something that makes me weak in the knees. 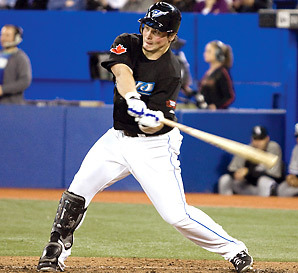 Yesterday the Blue Jays held an autograph session at the Jays Shop in the Eaton Centre with Travis Snider. Lindsay, a friend from work, and my younger brother got me all excited about going and getting his autograph. Again, not something I would normally do, but the Eaton Centre is a 2 minute walk from work and he would be signing during my lunch break. And did I mention I think Snider is incredibly attractive? He totally flexed for me. I’m pretty sure I’m blurry because I touched him and melted and he’s fake-smiling like “get this girl outta here”. That night, Snider’s play definitely improved! He got 5 RBI and a home run and I cheered from the bathroom where I happened to be both times somehow. If any other professional athletes are concerned about having played a bad game and need my special bicep squeeze to inject some extra swag into their play, I’m here to help you out. 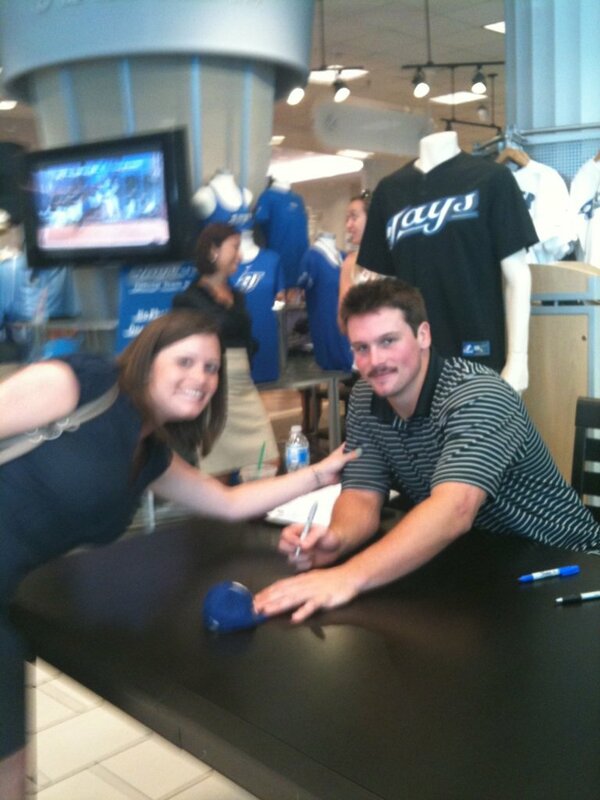 Posted on July 21, 2011, in Sports and tagged baseball, meeting Travis Snider, sports, Toronto Blue Jays, Travis Snider, Travis Snider girlfriend. Bookmark the permalink. Leave a comment.